I have an embroidery biz and just finished up a small project for hubby to give to a fellow worker for his 50th! Apparently he "digs" gardening!!! Pun intended! LOL! Soooo, I got this floppy hat and a pair of gloves and did a little stitchin'! On the hat, is a guy leaning on a shovel holding his prize flower....off to one side I put...Still Diggin' At and on the side, 50.....I haven't heard how it went over...but hopefully it will be something he'll enjoy! The reason i'm showing it here, you ask?? Welllll, my website has just undergone a HUGE overhaul and in the new one, I have an area that will accomodate ALL things cq!!! I am offering embroidered motifs, along with other things....and really need to hear what sorts of things folks like to use. I would like to provide a handy niche for folks that want something that is unique or non victorian and even possibly geared towards specific projects! There is sooooooo much that can be done with embroidery! Hmmmmm, maybe I should post a pic of some of my embroidered tp!!! LOL!!!! Let me hear your thoughts!!! I'd LOVE to be able to do something helpful and different! Thought i'd post a pic of the rr block that came home and had some issues...so i've been busy making changing some things on it so i'll be able to incorporate it into a larger piece! Wellllll, just posted three pics of a rr block I have been fighting for a year and half to get it home. It just arrived today!!! Yippee! I find it really sad that a person has to be threatened with having the authorities come and visit for them to return what rightfully belongs to others! Regardless, it's home, i'm happy and now all I have to do is add more to it and correct some issues I have with it.....no biggy! The chenille tree is interesting! It actually blends with the colors on the block pretty well. What do you think? This is a stitch combo I did...just sort of playing around on my cq block. Its about five layers of stitches and I think it's time for some beads in the same tones to add a little sparkle. I did the cretan, fly stitch, lazy daisy or chain stitch and pearl knots. Kind of fun to do these combo despite the time consumption. I getting more and more attached to this block though and becoming more and more an expression of who I am....crooked stitches and all! LOL!!! Definitely becoming a re-practice piece! I'm still in the throes of working out the technical issues of this software...we'll see if it works the way i'm wanting it too! I'm SUCH a technodoofus! Anywhoo, this is a pic of a current work in progress. It is really a lot more rich in color in person...another issue to be addressed! ;-) Anyway, as a part of my quest to become better in this art form and to continue to learn new stitch combos, I am using this piece to experiment on. I've actually done a bit more to it since this pic which i'll have to snap latter! I wonder in studying it, how many folks start with the ol' traditional five sided piece in the middle (or close to that)of the block. How many use a neutral, plain piece of fabric? I personally love texture and combining different fabrics so that some, like velvet, can add the depth and flavor i'm seeking to express in whatever I am working on. I've had oodles of comments on this particular block. What am I going to do with it? What's it for? What's that stitch? What's it called? And so forth. Kind of nice. Its a neat way to casually enter into a conversation with someone that normally ignores you and maybe discover something in common with them or at least just have a great talk about something I love! :) Soooo, I will continue to post progress on this block as time goes by. If anyone sees a great opportunity for a stitch combo or embellishment in a particular place on this block, please chime in!! I'd LOVE to hear whatcha have to say! I have been having computer issues, but thought I would still try and jot down a little missive here while I wait on things to download/re-load or just generally adjust! I am a die hard cq fan. I'm sure no one who has read the few bits i've written would guess that! LOL!!! The person I can honestly and whole heartedly blame for this passion is Judith Baker Montano!!!! 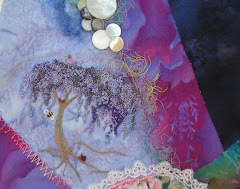 I ADORE her work....particularly her landscapes and her use or color, fabric and assorted "found" objects and motifs. I think I own all but one of her books and am proud to say that the group I helped found with a fellow "addict" is in the throes of actually bringing her to Denver/Colorado Springs for a session!!!! Wahoooo!!!! I am soooooo excited about this!!! We haven't even gotten so far as picking a class for her to teach or a date...but we're inching closer and i'll keep everyone posted as plans develop!!! Anyway....along the vein of fabrics and motifs, I have observed the varied opinions of others involved in this art and find that their preferences are as varied and distinctive as my own. Some folks are purists and will use only silk and velvet in their cq pieces. Me.....i'm not. I look for the texture that putting a variety of fabrics together can create. I'm not terribly flowery or victorian, but still enjoy the looks of some of the traditional methods as long as it's not too frilly. Again....that's just my style. I enjoy manipulating fabric and giving the pieces that I work on more dimension through that medium. As a result, I find that I play with quite a few of the cottons, batik's especially and silks and even some of the heavier tapestry/upholstery fabrics as they are more manageable. Then there's velvet. I LOVE the depth that velvet offers, but it truly is a challenge to capture it at times so I just find other ways to humor myself! Admittedly, I learn something almost every day when working within my little cq'd realm and if anyone has ANY suggestions to ease the burden of working with this slippery, shedding velvet monster, I would appreciate them taking a moment to share them here! I'd also like to hear what YOU like! Do you prefer the silks and rayons? Or do you like em all? Chime in! Lets see what everyone's up to! I also love to add special motifs via my commercial embroidery machine. I have found it is a super way to add a design that is chosen specifically to fit the personality of the person the cq piece is being given to! I admit there are times I will stitch a design out as a stand alone item, but often feel that doing that is redundant if i'm going to put it onto something right away. So i stitch it directly on while I sit and watch this marvelous machine in action! It never ceases to amaze me! Well, enough rambling for now....I think i'll go and try again to get the pics of the stitches i'm trying to show here on the blog... Have a great evening all! Lou Anne Sassone wrote back to me after my last missive about what some of her favorite stitches are. She doesn't have just one and LOVES to combine them! Which, in truth, is what is at the heart of cq. At least in my book! :_) Anyway.....I read thru her directions, couldn't visualize it....so.....I pulled out my handy dandy doodle cloth and set about figuring this stith combo. I have included it here. I'm still awaiting word from LA as to whether or not it is correct, but even if it isn't, it's still pretty cool and it will be something that I try again. One thing this DID show me is that it's important to keep on practicing those stitches so that they look more refined and distinct. Mine are pretty wobbly!!! LOL!!! But...again....for playing around it was fun, so i'm not all that unhappy with it. This combo is just a drop in the bucket compared to the gazillion that are out there and I hope to try some more on my block that i'm working on. Some of the combos I like are the buttonhole stitch, varied in lengths, with lazy daisy stitches on top and flowers on top of that, or perle knots. I like to play around with varieties of feather stitches too! This stitch is traditionally found in some of the older pieces that we have had in our family so it kind of gives me a warm feeling to continue the tradtion! Then there's the chain stitch, the herringbone, the cretan, the fern and the list goes on! What your favorite? I'd LOVE to hear!! !